Thanks to his experience with his great-grandmother, one US teenager is determined to do whatever he can to help those with the disease. Max Wallack (left) was six when he came face-to-face with Alzheimer’s disease. His great-grandmother Gertrude was staying with him and his family in the US and her condition slowly worsened. It was this experience that set him on a path to do whatever he can for those with Alzheimer’s disease. 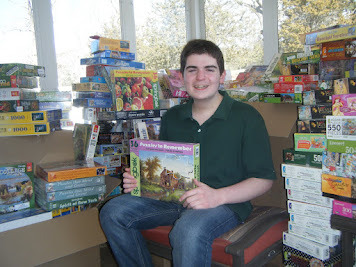 He not only has started his own non-profit called Puzzles To Remember at the age of 11, he has written a children’s book this year on the disease where half of the proceeds go to Alzheimer’s research, and he continues interning at an Alzheimer’s disease centre doing research. His work with the disease is timely, as more than 35 million people around the world live with dementia, including the common form, Alzheimer’s disease, and this number is expected to triple by 2050. Can you share the “eye-opening” experience with your great-grandmother and any unforgettable moments? Probably at the ages of six and seven, I mostly saw her condition worsen, as she needed extra help. At the time, she was around 90 years old. I would stay with her and help her cross the street or maybe hand her things at home. By the time I was eight, she had become very paranoid. One of my earliest memories was driving to my Tae Kwon Do lesson. My mom and grandmother were in the front seat, and I was in the back with Great Grams. Great Grams became very hostile and said that my mom and grandmother were talking about her, which they were not. There were also some very upsetting situations when Great Grams escaped from the house at night or early in the morning, and we had to notify the police. She felt the compulsion to run. On some level, she understood her situation, and she was trying to run away from her illness and toward the life she remembered from when she was much younger. About eight months before Great Grams’ death, we took her on vacation with us to Hawaii. Most of the time there, she seemed to enjoy herself. However, on one occasion, she jumped up out of her wheelchair, ran to a security guard, and told him we were trying to kill her. Apparently, once someone says that, they are required to call the police, so my family and I got to meet quite a few of the Honolulu Police Department! Max noticed that Alzheimer's patients working with jigsaw puzzles seemed calmer and less agitated than other patients. 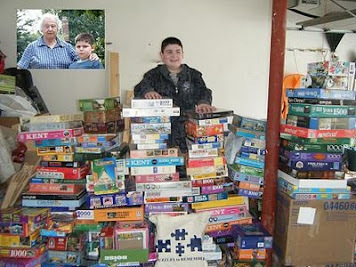 It was during this time you discovered the benefits of jigsaw puzzles. Can you share more and how that lead to Puzzles To Remember? During the last six months of her life, Great Grams was in and out of various hospitals and nursing homes, mostly as a result of the frequent urinary tract infections that come with increasing incontinence. When visiting her in these facilities, I noticed that patients working on jigsaw puzzles seemed calmer and less agitated than other patients. I tried to read about this and I discovered that remaining mentally-active could help slow down the progression of Alzheimer’s disease. Also, creative activities like arts and music, are controlled by the part of the brain that is one of the very last affected by this disease. So, after Great Grams’ death in 2006, I decided to collect jigsaw puzzles and donate them to the facilities that had cared for Great Grams. 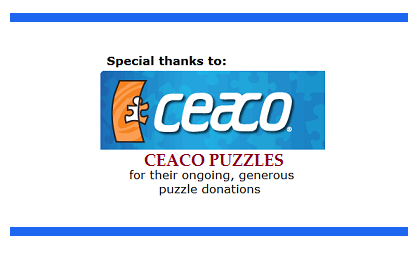 I contacted various puzzle manufacturers and I set up collection bins for gently used puzzles. Soon, donations of puzzles starting pouring in. After I had donated to the facilities that had cared for Great Grams, I started donating to all the facilities in eastern Massachusetts, where I live. Soon, I realised that I needed a source of income in order to be able to ship the puzzles to facilities further away, so I decided to become a non-profit organisation, that way I could accept tax-free donations. Shortly thereafter, I realised that there was a dearth of puzzles that were best suited to the needs of Alzheimer’s patients. Most puzzles of few pieces and large-piece sizes have images meant for children, and adults with Alzheimer’s are still adults who don’t enjoy puzzles with childish themes. I then contacted Springbok Puzzles, the leading puzzle manufacturer in the US, and asked them if they could make puzzles with fewer pieces, large-sized pieces, bright colours, and memory-provoking themes. That’s how the Springbok Puzzles To Remember came into existence. For the past three years, I have worked together with Springbok to produce new images for their Alzheimer’s puzzles. I accept no cash royalties for my work. Instead, each year, Springbok gives me an “allotment” of puzzles that I can direct to have them send to any facility of my choosing. I have since distributed over 15,500 puzzles to over 2,100 nursing facilities, adult daycare centres, veterans’ facilities and memory cafés (casual social meeting venues for those with progressive memory or cognitive impairment and their caregivers, family and friends) around the world. 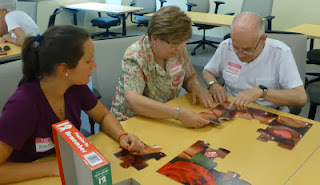 Last year, new research was done at Rush University School of Medicine, US, showing that remaining cognitively active with things like puzzles can postpone the point at which an Alzheimer’s patient is no longer able to function in society. It might not affect their longevity, but it can affect their quality of life for a substantial time. And now at 17, you are still doing work that involves Alzheimer’s disease where I understand you are not taking a Summer Break but interning in the Laboratory of Molecular Psychiatry in Aging at Boston University’s Alzheimer’s Disease Center. Can you share the cutting-edge research you are doing there? I love my work in the Molecular Psychiatry and Aging Laboratory. I learn more there than anyway else. I have been working there for almost three years. I work up to 20 hours per week during the school year, and full-time during summers. I enjoy the teamwork there. No one in our lab feels above carrying boxes around and everyone there respects the opinions of others, even the opinions of a lowly intern like me. It is an environment where I can thrive. Recently, a paper I co-authored was published in the “Journal of Alzheimer’s Disease”. It was a study that showed that ACE inhibitors like lisinopryl can be beneficial to Alzheimer’s patients, but only if they are of the APOe3- or APOe2-genotype. They are ineffective to those of the APOe4-genotype. Currently, I am working on a very exciting project that we are writing up for a publication. It involves administering a naturally-occurring hormone, which has already been approved for use in diabetics. Results are showing that this hormone is capable of clearing Abeta (amyloid-beta) out of the brain and into the bloodstream. We have conducted these studies in mice, and their ability to perform on maze tests increase after the Abeta is cleared out. We have just begun testing this drug in humans. I hope to continue working in the lab until I graduate from Boston University, so, at least until Summer 2015. What field of study are you doing at BU? I am a neuroscience major. I definitely want to go to medical school. My plan is to become a geriatric psychiatrist. And you have written a book too this year! Tell me about it and how much it mirrors your own life. “Why Did Grandma Put Her Underwear in the Refrigerator? 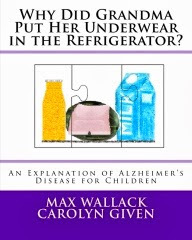 An Explanation of Alzheimer’s Disease for Children” is something that I had been writing in my head for many years. Then, one day I asked my former high school English teacher if she would be my co-author. She is gifted at humour, and I felt she could keep the book from becoming too dark and sad. Within a few hours, I wrote it and sent it to her but of course, the book underwent several revisions before the final product was published. The book is really based on three things. Some of it, like the police returning Grandma home, are things I experienced repeatedly. Other things, like Julie doing puzzles with Grandma and feeding Grandma, are actually based on a little girl who is six years old and lives in New York City. Her grandmother has Alzheimer’s disease, and I correspond frequently with the family, whom I first “met” through my writing on the AlzheimersReadingRoom.com. The third aspect is taken from my own readings and research. For instance, the use of the red plate, which really does make a difference in feeding of dementia patients. 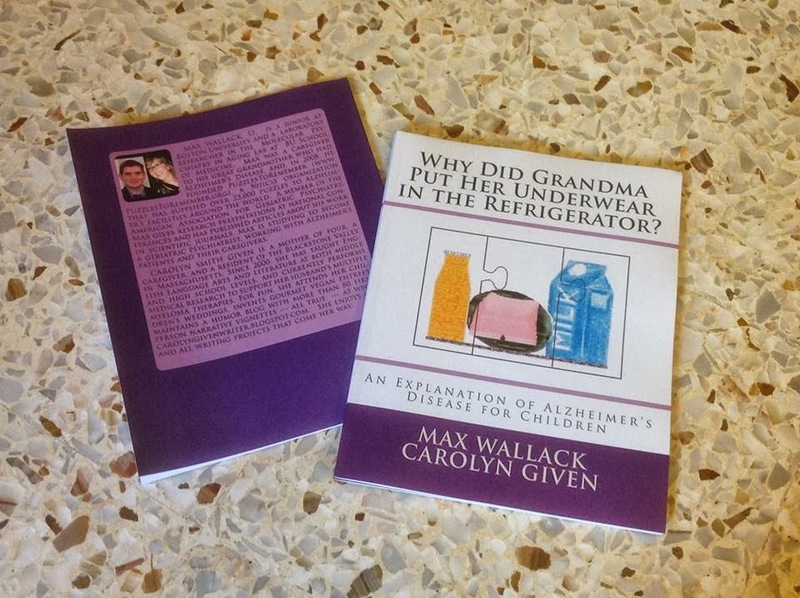 § Making a difference in the lives of Alzheimer’s patients and their caregivers. 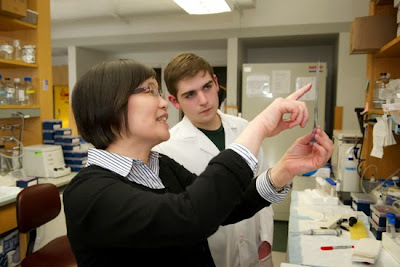 § Helping ward off the oncoming worldwide tsunami of Alzheimer’s disease. § Working together with a team of people who are upbeat and enjoy their work. § Spending time with my good friends who support and respect my efforts. § Supporting my own friends, many of whom are deeply involved in community service of various forms. 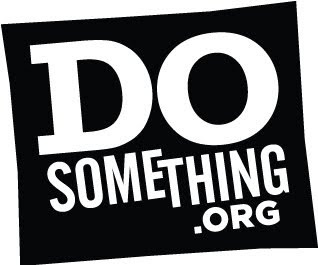 § Thinking about new ways to make a difference. I am currently writing up several papers for publication, and I am applying for a grant. It would be the first grant on which I would be listed as a “principal investigator”. In the Spring, I will begin applying to medical schools. If you could get three messages out to people about Alzheimer’s, what would they be? § In our ageing society, Alzheimer’s, in addition to its devastating effects on individuals and families, represents the single biggest threat to economies. We need to invest in treatments and/or cures NOW. § The Alzheimer’s patient has not changed into a different person. They are “still there”. Their means of interacting may have changed. It’s important to find ways to still communicate with these patients. § Hiding this disease from family and friends only serves to isolate patients and their caregivers. We need to be more public about this problem. I think memory cafés are one of the best ways to avoid isolation. 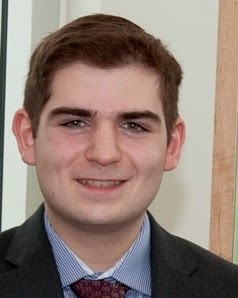 You must be the youngest ever dedicated to doing work connected to Alzheimer’s disease. Why do this work when you could just focus on being a regular kid at your age taking up hobbies, hitting the beach in the Summer and doing other things? My friends know that I spend a lot of time having conventional “fun”. I play a lot of pool and ping-pong, and I spend way too much time on Facebook and playing video games. The difference may be that I consider my work combatting Alzheimer’s disease to also be “fun”. I guess I enjoy many different kinds of fun and I think everyone ought to be able to enjoy whatever harmless activity is fun to them. If that one day came when there is a cure for Alzheimer’s disease, what would you do? When do you think that day will come? I think it is likely that we are approaching a time when Alzheimer’s will be treatable. Even postponing the disease by five or 10 years would make a very huge difference, and I think this goal is achievable. Though I think we may be a bit further away from a “cure”. Any inspiring words for other youths on them doing ground-up initiatives like yours that help the community? My advice is to choose something you are very passionate about, and begin by doing just some small things to help others. The feedback of seeing the positive effects of one’s work on the lives of others is so powerful that it will spur you on to continue making a difference. Don’t try to start by constructing a huge project and plan. Start small and let your passion lead your way.